A roof is an essential part of any building, in that it provides the necessary protection from rain, sun, wind, heat and cold. The integrity of the roof is important for the structure of the building itself, as well as for the occupants and the goods stored within the building. The roof structure must be designed to withstand the dead load imposed by the roofing and framing, as well as the forces of wind and, in some areas, snow or drifting dust. The roofing must be leakproof and durable and may have to satisfy other requirements such as fire-resistance, good thermal insulation or a high thermal capacity. The plane of the surface, i.e. whether it is horizontal or pitched. The structural principles of the design, i.e. the manner in which the forces set up by external loads is resolved within the structure. The flat roof is a simple design for large buildings in which columns are not a disadvantage. Although simple beams can be used for spans up to about 5 metres, with longer spans it is necessary to use deep beams, web beams or trusses for adequate support. As farm buildings often need large areas free of columns, it is not common to find flat roofs with built-up roofing. Flat roofs are prone to leaks. To prevent pools of water from collecting on the surface, they are usually built with a minimum slope of 1:20 to provide drainage. The roof structure consists of the supporting beams, decking, insulation and a waterproof surface. The decking, which provides a continuous support for the insulation and surface, can be made of timber boards, plywood, chipboard, metal or asbestos-cement decking units or concrete slabs. The insulation material improves the thermal resistance and is placed either above or below the decking. The most common design for a waterproof surface is the built-up roof using roofing felt. This material consists of a fibre, asbestos or glass fibre base that has been impregnated with hot bitumen. The minimum pitch recommended for built-up roofs is 1:20 or 3°, which is also near the maximum if creeping of the felt layers is to be prevented. For flat roofs, two or three layers of felt are used, the first being laid at right angles to the slope commencing at the eaves. 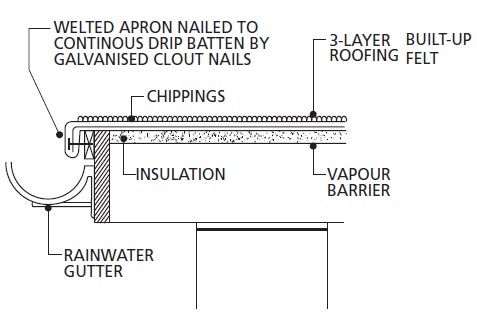 If the decking is made of timber, the first layer is secured with large flathead felting nails and the subsequent layers are bonded to it with layers of hot bitumen compound. If the decking is of a material other than timber, all three layers are bonded with hot bitumen compound. While it is still hot, the final coat of bitumen is covered with layers of stone chippings to protect the underlying felt, to provide additional fire resistance and to increase solar reflection. An application of 20 kg/m² of 12.5 mm chippings of limestone, granite or light-coloured gravel is suitable. Where three layers of roofing felt are used and properly laid, flat roofs are satisfactory in rainy areas. However, they tend to be more expensive than other types and require maintenance every few years. Soil-covered roofs have good thermal insulation and a high capacity for storing heat. 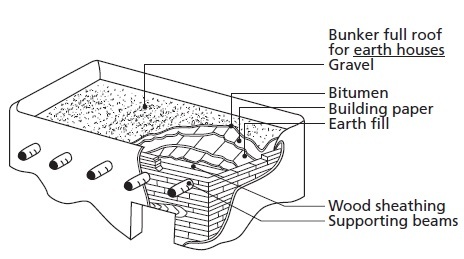 The traditional earth roof is subject to erosion during rain, and requires regular maintenance to prevent leakage. The roof is laid rather flat, with a slope of 1:6 or less. The supporting structure should be generously designed of preservative-treated or termite-resistant timber or poles, and should be inspected and maintained periodically because a sudden collapse of this heavy structure could cause great harm. The durability of the mud cover can be improved by stabilizing the top layer of soil with cement, and it can be waterproofed by placing a plastic sheet under the soil. 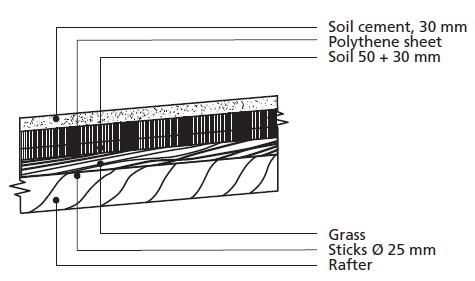 Figures below show two types of earth roof. However, the introduction of these improvements adds considerably to the cost of the roof. Therefore the improved earth roof is a doubtful alternative for lowcost roofing and should be considered only in dry areas where soil roof construction is known and accepted. Monopitch roofs slope in only one direction and have no ridge. They are easy to build, comparatively inexpensive and recommended for use on many farm buildings. The maximum span with timber members is about 5 metres, so wider buildings will require intermediate supports. Also, wide buildings with this type of roof will have a high front wall, which increases the cost and leaves the bottom of the high wall relatively unprotected by the roof overhang. When using corrugated steel or asbestos-cement sheets, the slope should be not less than 1:3 (17° to 18°). A lower sloping angle may cause leakage, as strong winds can force water up the slope. The rafters can be made of round or sawn timber or, when wider spans are required, of timber or steel trusses, which can be supported on a continuous wall or on posts. The inclined rafters of a pitched roof meet the wall plates at an angle and their load tends to make them slide off the plate. To reduce this tendency and to provide a horizontal surface through which the load can be transferred to the wall without excessively high compressive forces, the rafters in pitched roofs are notched over the plates. To avoid weakening the rafter, the depth of the notch (seat cut) should not exceed one third the depth of the rafter. When double rafters are used, a bolted joint is an alternative. The rafters should always be properly fixed to the walls or posts to resist the uplift forces of the wind. The bottom notch in the rafter that rests on the plate is called the ‘seat cut’ or ‘plate cut’. The top cut that rests against the ridge board is called the ‘ridge cut’. The line running parallel with the edge of the rafter from the outer point of the seat cut to the centre of the ridge is called the ‘work line’. The length of the rafter is the distance along the work line from the intersection with the corner of the seat cut to the intersection with the ridge cut. If a ridge board is used, half the thickness of the ridge board must be removed from the length of each rafter. The ‘rise’ of the rafter is the vertical distance from the top of the plate to the junction of the workline at the ridge. The ‘run’ of the rafter is the horizontal distance from the outside of the plate to the centreline of the ridge. The portion of the rafter outside the plate is called the ‘rafter tail’. 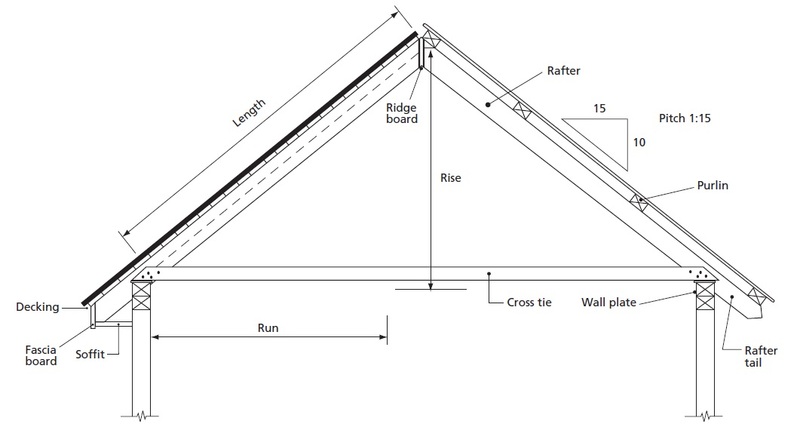 The ‘collar beam’ or ‘cross-tie’ prevents the load on the rafters from forcing the walls apart, which would allow the rafter to drop at the ridge. The lower the collar beam is placed, the more effective it will be. Occasionally, small buildings with strong walls are designed without collar beams. The only advantage of this design is the clear space all the way to the rafters. Scissor trusses, as shown in Figure 8.51, at the same time allow some clear space. The right-hand rafter shows purlins spanning the rafters and supporting a rigid roofing material, such as galvanized steel or asbestos-cement roofing. The left-hand rafter is covered with a tight deck made of timber boards, plywood or chipboard. It is usually covered with a flexible roofing material such as roll asphalt roofing. The left-hand eave is enclosed with a vertical ‘fascia’ board and a horizontal ‘soffit’ board. The pitch is shown on the small triangle on the right side. A hip roof has a ridge in the centre and four slopes. Its construction is much more complicated, requiring compound angles to be cut on all of the shortened rafters and provision for deep hip rafters running from the ridge to the wall plate to carry the top ends of the jack rafters. The tendency of the inclined thrust of the hip rafters to push out the walls at the corners is overcome by tying the two wall plates together with an angle tie. At the hips and valleys, the roofing material has to be cut at an angle to make it fit. The valleys are prone to leakage, and special care has to be taken in the construction. Four gutters are needed to collect the rainwater from the roof, but this does not necessarily mean that there will be an increase in the amount of water collected. As this is an expensive and difficult way to roof a building, it is only recommended in cases where it is necessary to protect mud walls or unplastered brick walls against heavy driving rain and, for wide buildings, to reduce the height of the end walls. The conical roof is a three-dimensional structure that is commonly used in rural areas. It is easy to assemble and can be built with locally available materials, making it inexpensive. It must be constructed with a slope appropriate to the roofing materials to prevent it from leaking. The conical roof design is limited to rather short spans and to either circular buildings or to small, square buildings. It does not allow for any extension. If modern roofing materials are used, there is considerable waste because of the amount of cutting needed to secure a proper fit. To distribute the load from the roof evenly to the wall. To supply a fixing point for the rafters. To resist the tendency of the inclined rafters to press the walls outwards radially by developing tensile stress in the ring beam. If the ring beam is properly designed to resist these forces and secondary ring beams are installed closer to the centre, a conical roof can be used on fairly large circular buildings.